This year in 2017 Ducati has launched its new series according to the desire and taste of its customers. The new 2017 Ducati SuperSport Bike is one of the best solutions for the desire of comfort with versatility that most of the riders dream. It comes with the sporty spirit with the powerful engine and stylish chassis. Its screen is adjustable up to 50 mm to ensure better airflow protection. 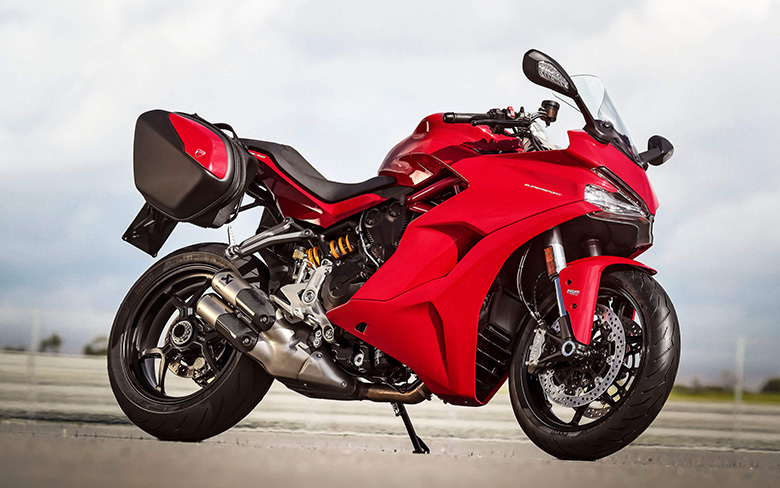 Its long range 16-liter fuel tank provides an excellent touring capability, moreover, its three riding modes guarantees an optimized control over the bike. The review of new 2017 Ducati SuperSport Bike with its specification are written below. 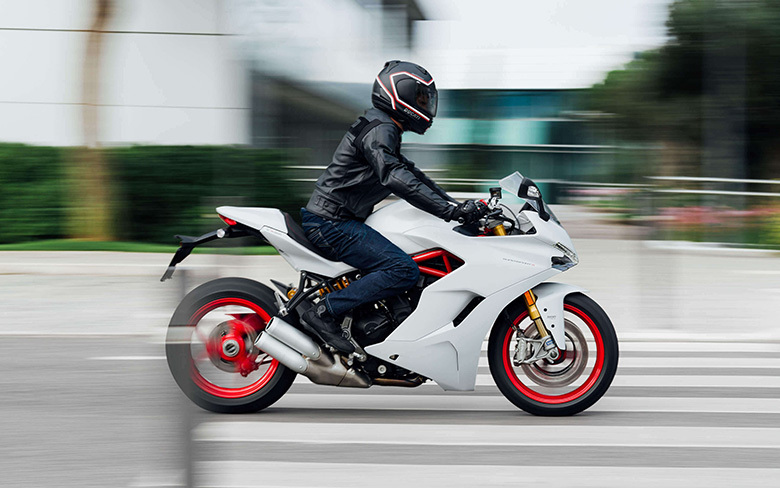 The all-new 2017 Ducati SuperSport Bike features the 937 cc of Trestastretta 11 degree engine, which delivers the power of 113 horsepower at 9250 rpm. This engine is specially redesigned with the new crankcase, new heads with different water passages and an alternator cover with the specific design. The injection control system is totally new and is fully functional. This engine has earned the Euro 4 approval. It contains the four valves per cylinder, the secondary air system, liquid cooling, bore and stroke ratios of 94 mm and 67.5 mm while the compression ratio is 12.6:1. This bike requires very low engine maintenance or in other words, it has long maintenance intervals. 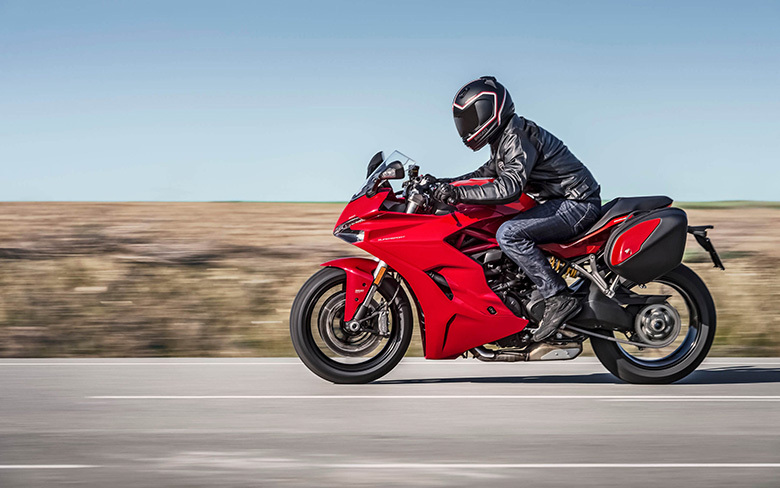 This engine comes with a six-speed gearbox with the new gear sensor, which allows this sports bike to benefit from the advanced Ducati Quick Shift (QDS). Its new mechanical cable clutch requires less force applies on the lever. It is oil bath clutch with an anti-wheelie function allowing the rider to have full control over the bike. The all-new 2017 Ducati SuperSport Bike features the triangular ergonomics, which combines practicality and sports riding enjoyment. It offers comfortable long day ride while ensuring the full control of rider over the bike. With the seat height of about 810 mm, the rider can easily reach ground during stops. The height of handlebars is also carefully managed so that rider can easily reach them plus the footpeg position provides the comfortable reach without any strain to the knee. The seat of different heights is available in accessories so that it may fit with a variety of riders. The plexiglass windscreen is adjustable up to 50 mm to guarantee the maximum protection to the rider. The all-new 2017 Ducati SuperSport Bike comes with the best frame having a stylish color combination. This is the compact, lightweight and stylish frame with the dry weight of about 184 kg while the curb weight is 210 kg. The wheelbase, head angle, and trail is carefully adjusted to make it agile, quick and stable during cornering. 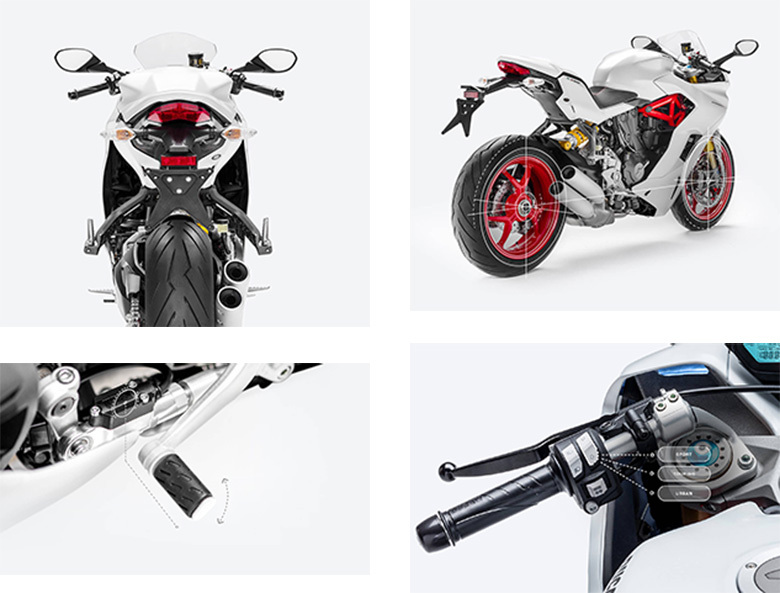 This Ducati bike is equipped with the single-sided swingarm in die-cast aluminum, which provides it rigidity and a reduced weight. This bike has 43 mm diameter of Marzocchi fork at its front tire while single Sachs shock at the rear. The aggressive Y-design three-spoke alloy wheels also enhance the overall design of the bike. The 3.50×17 wheel at the front and the 6.00×17 at the rear mount 120/70 ZR 17 and 180/55 ZR 17 Pirelli Diablo Rosso™ III. This latest-generation tire is the direct successor to the DIABLO ROSSO™ II, from which it inherits its compound quality, excellent grip in all conditions and wear-resistance. DIABLO ROSSO™ III presents new profiles, latest-generation materials and an innovative structure that increases its handling and grip, raising the performance offered by a road tire to a higher level. The characteristic “lightning bolt” tread design, an evolution of that of the well-known DIABLO™ SUPERCORSA, guarantees the tire is compact, with the better full/empty ratio and greater efficiency in terms of water drainage, qualities that are particularly useful for road use. The sports mode of new 2017 Ducati SuperSport Bike provides the lean angle of 48 degrees that ensures limitless fun. The rear tire is about 180/55 size provides an incredible handling and traction. This bike features the front brakes of Brembo M4-32 monobloc calipers that use two discs with 320 mm of diameter. It is activated with Brembo PR18/19 radial pump with the separate tank and adjustable lever. The rear brakes feature the 245 mm of a disc, which is activated by the dual-piston Brembo caliper. This braking system is managed by the Bosch 9MP ABS system with the three maps, which can be deactivated when needed. 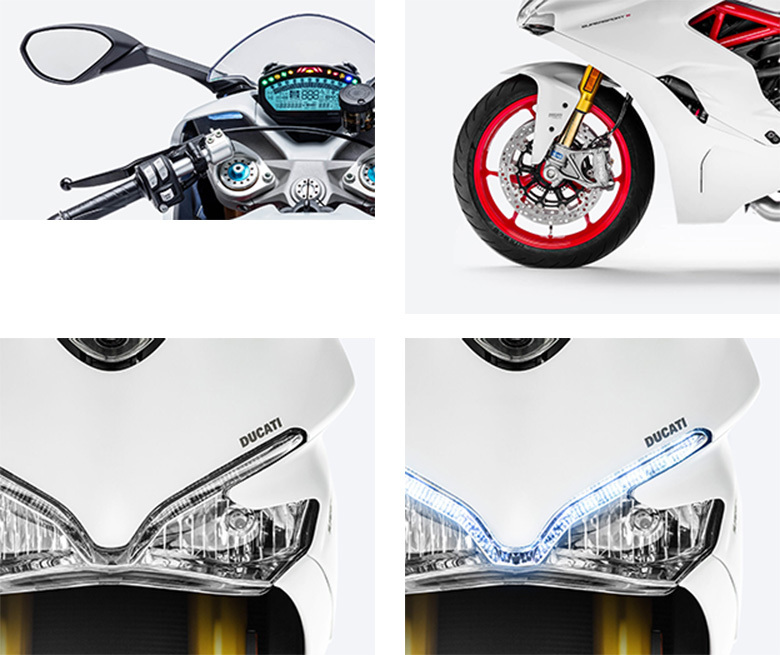 The all-new 2017 Ducati SuperSport Bike comes with the Bosch ABS system. It is 9MP with the integrated pressure sensor, which can be deactivated or adjusted according to three increasing levels of intervention. The level one is recommended for very grippy surfaces. It delivers track level performance with the intervention only at the front. 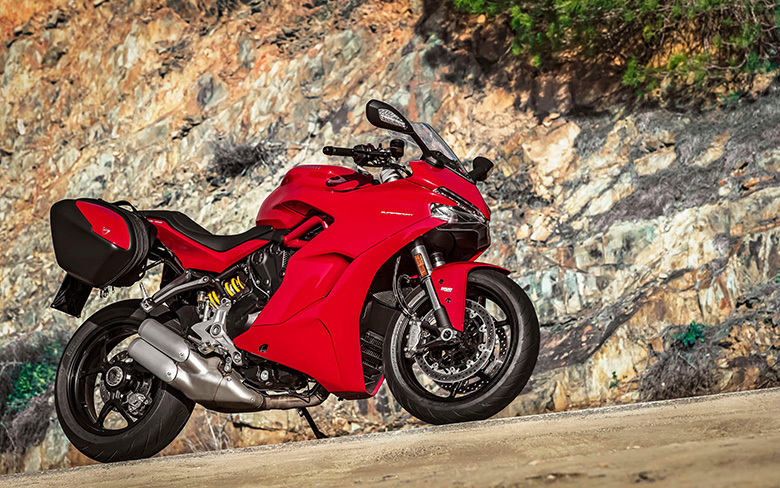 With its next levels, the ABS intervene on both wheels, supporting the riding on the surfaces with the less grip with the anti-wheelie function at the rear. 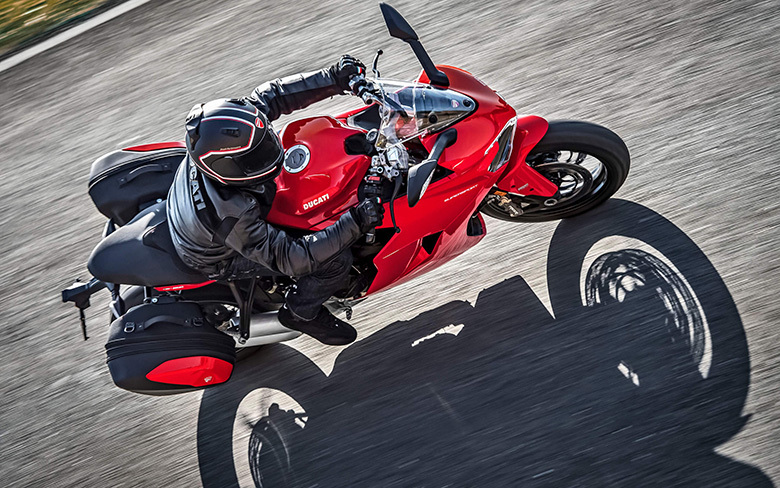 The Ducati Traction Control (DTC) is the latest system which identifies the rear wheel sliding and it intervenes to control it. It is based on eight different profiles, which ensure the different tolerance values, to be selected according to the riding skills of rider. It can be used for three different riding modes. The level of intervention by DTC can be easily personalized or entirely deactivated. The Ducati Quick Shift (DQS) is an electronic system, which is derived from racing that allows for gear shifting without any use of the clutch or closing the throttle. 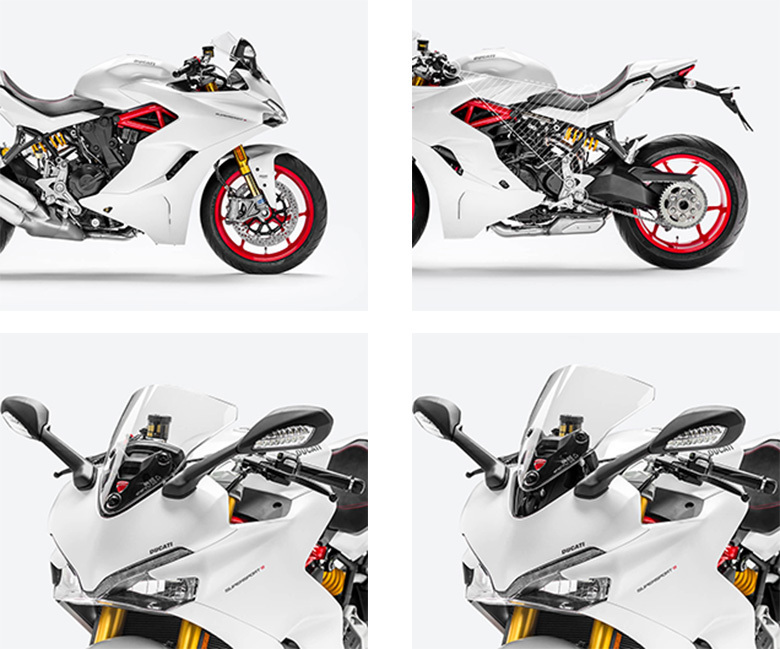 The new 2017 Ducati SuperSport Bike features an advanced control panel which lets the rider to have an easy access to information regarding the engine, consumption, and settings such as ABS Bosch and DTC. This display lets the rider for configuration of the riding modes and visualization of Ducati Multimedia System information to connect the bike to the smartphone using the Bluetooth technology. This connection allows the rider to control certain functions like incoming calls and messages received. This article is about the recently launched 2017 Ducati SuperSport Bike. 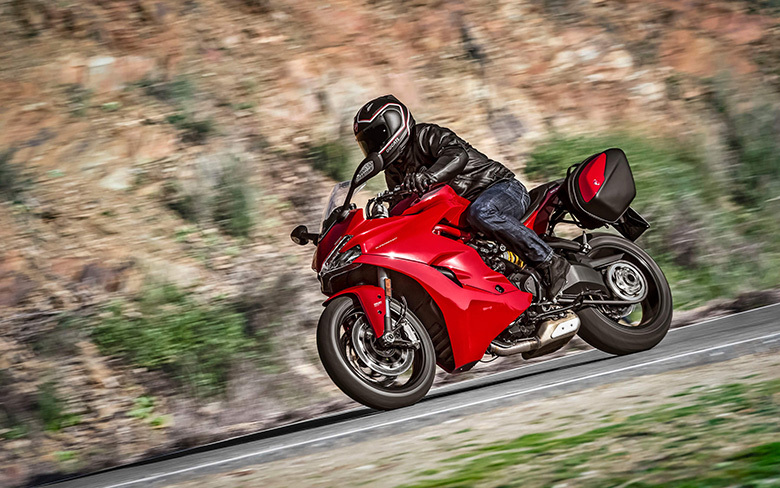 It is an incredible sports bike that comes with the number of features. Its powerful engine provides the strong acceleration and torque. The chassis is light in weight and is compact offers the best riding experience. The seat height is carefully adjusted to have the maximum control and comfort simultaneously. In short, it is an amazing motorcycle and one should enjoy its ride.